Smoking and the French - in other words, no time today to do anything on the railway. I have never liked breathing in other people's smoke. However, my views are softening towards the practice of smoking cigarettes. Certainly, smoking is still widespread in France and if one wants to sample French cafe society which I very much enjoy then sometimes one has to accept sitting in close proximity to a smoker. Two incidents which amused us on our recent sojourn to France involved smoking. Firstly, going outside at the interval during a concert of choral music held in a local church, we stood next to many members of the excellent 65 strong choir who had gone out for a smoke. Nothing furtive about this; no cowering in doorways or in designated smoking areas but fulsome lively socialising; with cigarettes. Secondly, one lovely sunny morning, we observed a long line of primary school children going somewhere, walking in pairs, complete with rucksacks, white socks etc. What a happy scene they made chatting away to their partners and being led by their two teachers - also chatting to each other and both (ostentatiously, I might add) smoking cigarettes. "The fact remains that French smokers seem to inhale their cigarette smoke in order to supply their brain with a sort of intellectual super fuel. Still, the health conscious society we now live in as well as political discourses urging us all to eat five portions of fruit a day are set to guillotine an aspect of France’s intellectual identity. Perhaps I am guilty of possessing a nostalgic sentiment towards the twentieth century and forget that modern day writers no longer feel the need to smoke while putting pen to paper." 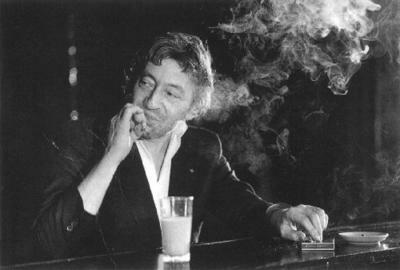 And then to prove the point posts this photograph of Serge Gainsbourg with his beloved cigarette. 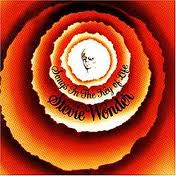 Currently listening to "Songs in the Key of Life" - full of great pop songs. 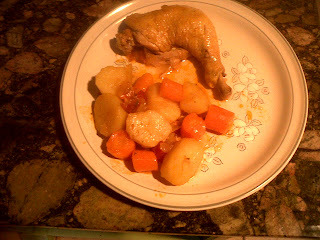 Chicken, potatoes and carrots all cooked in the same pot because our Aga is still out of commission. 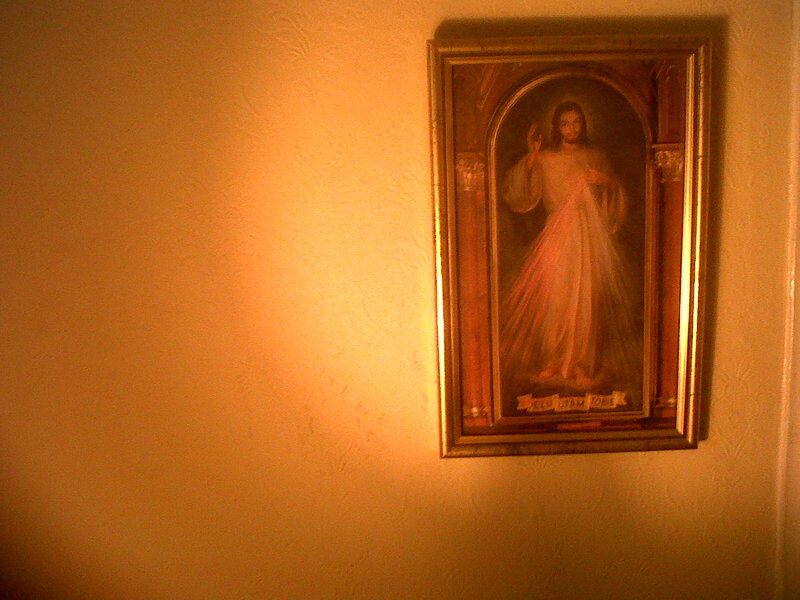 The only religious object we have on display in our house is this small picture next to my bed. 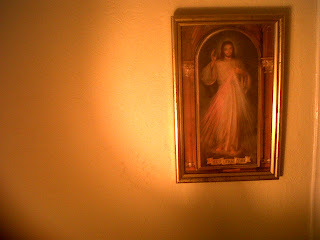 The legend at Jesus feet is: "Jezu, ufam tobie" which is Polish for "Jesus, I trust in you." When I am too mentally bankrupt to articulate any prolonged prayers I repeat this to myself and it gives me the strength to go on. "Jesus, I trust in you."